The credit card market is very competitive. Card issuers are in heavy competition for your business. As a result, credit card companies are quick to offer perks to win consumers over. However, not all perks are created equal. In fact, consumers need to take certain steps to ensure those perks don’t turn into expensive financial headaches that cause damage to one’s financial life for years to come. To convince consumers to sign up for a particular credit card, the credit card issuer may offer a zero percent interest rate on the card for the first year. If you carry a balance on the credit card, you won’t pay any interest. Remember, interest charges only kick in if you fail to pay off the balance in full. An introductory zero percent interest rate is a dangerous perk. First, it incentivizes consumers to charge more than they can afford thanks to the lack of interest charges. Secondly, once the promotional rate expires, the interest rate will adjust significantly higher. It could be 15% or more if you have poor credit history. If you start using the card for a host of different expenditures for the first year and leave a balance on the card, you must pay off the entire balance before the promotional rate expires. If you don’t, interest will start to accrue on the entire balance. What if you find yourself in a financial pickle in a year’s time and are suddenly unable to gather the money to pay for that entire balance you’ve charged up over the past year? This is how the introductory interest rate perk can easily turn into a financial nightmare. Just because there is a zero percent interest rate doesn’t mean you don’t have to make monthly payments. You still need to make the minimum payment to keep the account current. If you make a late payment or miss a payment, the credit card company may remove your zero percent promotional rate and replace it with a much higher rate as a penalty. This higher rate may even be above what’s typically charged on a traditional credit card. So if the normal interest rate on a credit card without a promotional rate is 15%, the penalty rate could be as high as 25%. In other words, not only will you lose your promotion rate, but you’ll take on an even higher interest rate than normal as a consequence for missing that payment. The credit card statement should disclose what interest rate you’ll receive if you miss a payment. If it doesn’t, call the credit card issuer to find out. Bottom line: don’t sign up for a credit card just because it has a zero percent introductory interest rate. You should always plan to pay off the credit card balance in full each month. 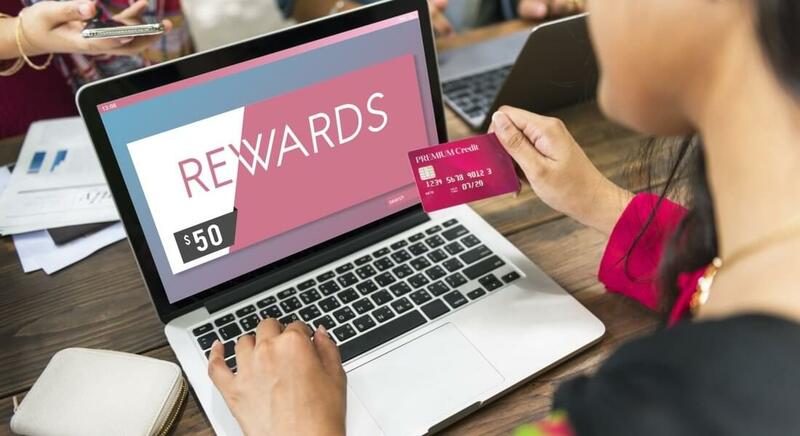 A credit card company may also offer you a certain number of rewards points for signing up for the card and meeting minimum spending requirements. Sometimes it could be as many as 50,000 points. But there’s a caveat: in order to receive the points, you have to spend a certain amount of money on the card within the first two or three months. This amount can be $3,000 or more. Unless you’re in the market for a new computer or television, this can be a tough level of spending to meet in just a few months. In order to meet this threshold, you may find yourself looking for excuses to spend money. This is a recipe for financial disaster. Pressure to spend money is not a healthy financial habit. If you are unable to pay off the $3,000 balance (or whatever the threshold is for earning the reward points), interest charges will accrue. These charges may wipe away any financial benefit you received from scoring the 50,000 rewards points. All of a sudden that free round-trip international airline ticket you scored for free with the points turned into quite an expense thanks to interest charges on your credit card. This is another example of how a credit card perk can turn into a financial headache. Bottom line: be careful about applying for credit cards just because they offer fancy perks, like tens of thousands of airlines miles or rewards points. It only makes sense if you can pay your balance off in full every month. Another introductory perk on credit cards is for the annual fee to be waived during the first year. An annual fee is simply a fee to keep the credit card open. It’s just another source of revenue for the credit card company. Cards that offer significant introductory perks, like rewards points or statement credits on your first balance, may also come with higher annual fees. Some annual fees can be as little as $95 a year, but other cards have fees as high as $495 a year. Though with the higher fee, you may gain access to certain airport lounges, a perk for frequent travelers. A good rule of thumb is to apply for credit cards that have no annual fee. Let’s say you keep your credit card for 10 years. If the annual fee is $495, you’ll pay almost $5,000 in annual fees over the decade. This money is better served in your 401(k) account or your Roth IRA to help bolster your retirement savings.